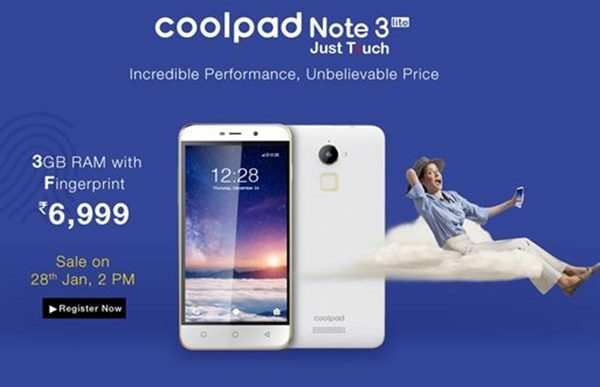 To fulfil the dream of Indians, CoolPad has launched the best smartphone at an affordable price, I am talking about the all new Coolpad Note 3 Lite which launched in Indian market priced at Rs 6,999.. Coolpad Note 3 Lite slated to go on sale through Amazon on 28th Jan. 2016, 2PM in in White, Yellow, Pink, Blue and Green colour option. The pre registration for 1st flash sale starting from Today 5PM through Amazon. The all new Coolpad Note 3 Lite supports Finger print scanner, Android 5.1 Lollipop and 3GB RAM supports Dual-SIM(Micro SIM) with Dual-Standby , 4G LTE, High Speed surfing on 4G network (LTE: TDD Band 40; FDD Band 3), 3G, Wi-fi, Bluetooth, GPS, USB comes with a bigger 5”-inch HD IPS display with resolution (1280 x 720 pixels), Colour Depth 16M with stunning colour consistency and wide angle HD viewing perfect for watching movies, playing games and reading e-books. Coolpad Note 3 Lite promising mind-blowing multitasking because of it’s powerful 64-Bit Quad-core MediaTek MT6735 processor clocked at 1.3GHz with 3GB RAM and runs on Android 5.1 Lollipop OS with Cool UI 6 while 16GB ROM and 64GB MicroSD card slot offers enough space to store your data. For shooting Coolpad Note 3 Lite combines a 13-MP Rear camera with LED Flash, Auto Focus, CMOS Sensor, 5 Element HD Lens and 5-MP front facing camera with CMOS sensor for clicking selfies packed with a 2500mAh battery promising talk time up to 3 hour, browsing time up to 10 hour and standby time up to 200 hours. measures 151 x 77.00 x 9.30mm and weight is just 155gm. It’s predecessor CoolPad Note 3 is available in India at Rs 8,999. The all new Coolpad Note 3 supports Finger print scanner, Android 5.1 Lollipop and 3GB RAM supports Dual-SIM(Micro SIM) with Dual-Standby , 4G LTE, 3G, Wi-fi, Bluetooth, GPS, USB comes with a bigger 5.5”-inch HD IPS display with resolution (1280 x 720 pixels), Colour Depth 16M run on powerful 64-Bit Octa-core octa-core MediaTek MT6753 processor clocked at 1.3GHz with 3GB RAM and runs on Android 5.1 Lollipop OS with Cool UI 6 while 16GB ROM and 64GB MicroSD card slot. Coolpad Note 3 also combines a 13-MP Rear camera with LED Flash, Auto Focus, CMOS Sensor, 5 Element HD Lens and 5-MP front facing camera with CMOS sensor for clicking selfies packed with a 3000mAh battery. At last few honest word, the all new Coolpad Note 3 Lite is coming to rock and rule the Indian market. What you think? Please be open to give your view. Please clarify whether the battery of coolpad note3 lite is fixed or detachable. Coolpad note 3 is is awesome. …i like that forever & i want that phone. ….